Ever since I read these words from Theodore Roosevelt years ago, I’ve tried my best to keep them close at hand and at the forefront of my mind. We’re headed down the path of life and we divert our attention to someone else and immediately, we’re crippled. We see someone else better at it than we are. What is it? Well, it could be anything. Maybe they have a higher paying job, a bigger house, more expensive car, maybe they’re better at something than we are. The list goes on. We’re just bebopping along, perfectly content, until we’re distracted. Then it all goes downhill. A few weeks back, the spring soccer season was wrapping up and Jack started giving some consideration to trying out for all-stars. One afternoon in the car, I could hear the disappointment in his voice when he told me he had decided not to try out. “Well, there are so many boys on the other teams that are better than me; I just don’t think I’ll make it. I’m not good enough,” he said. I was crushed. How could my boy ever think he wasn’t good enough for something. But still, as a parent, I was caught in between the ideas that I should always encourage him and the fact that he could be crushed if he doesn’t make it. Do I save him from the pain of failure? Or do I push him out there? I could hear it in my head, comparison is the thief of joy. My boy LOVES soccer. He shouldn’t let the idea that there are others who are better keep him from trying something he wants to do. Folks, the reality is that there will almost ALWAYS be someone out there who is better than you, more successful than you, has a nicer car than you, plays soccer better than you. And we can’t let that keep us from the things we love. I’m reminded of some words I shared with a group I spoke to a few years back. When we get caught up in the whole “grass is greener” thing, I told them to stay so intently focused on keeping their own grass green than they don’t have the time to see if the neighbor even has grass. We need to pay attention to our own grass. He made the all-star team. Sure did. And while he readily admits, he’s not the best player, he’s realized we all play a part on the team. I hope that he’s also learned how comparing himself to the other players could have cost him the chance to be on the all-star team. But he probably hasn’t. He’s hardheaded like his daddy. 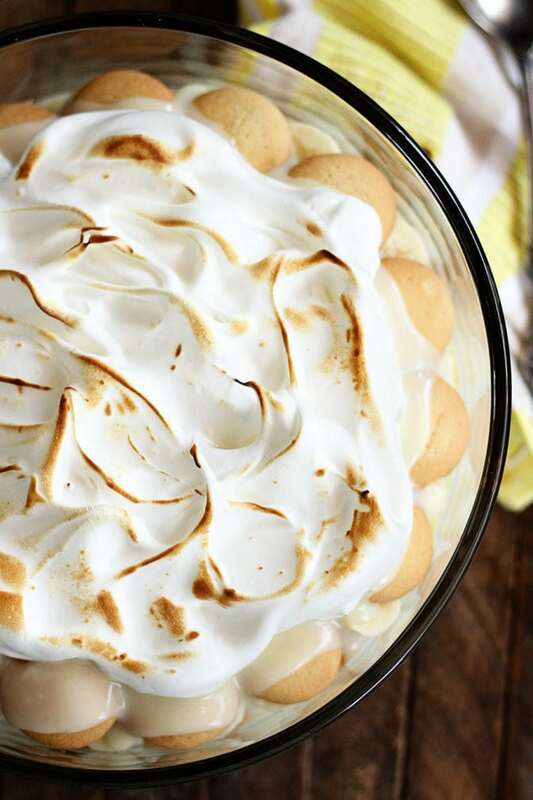 Y’all this banana pudding is the recipe from my cookbook and its my absolute favorite. It’s a classic and is always a hit wherever I serve it. One thing I like to do differently is to allow the custard to cool before I pour it over the bananas and vanilla wafers. It helps to keep the bananas from browning. Yes, you’re going to put the whole thing in the oven, but it won’t be long enough to heat the pudding all the way through again. And while the meringue, like the recipe is written, is the traditional topping, I do sometimes skip that and top it with with freshly whipped cream if I’m in the mood. Y’all enjoy! In a medium saucepan over medium-low heat, combine 1 1/2 cups sugar, flour, salt, egg yolks, and milk. Cook the custard, stirring very frequently to keep from scorching, 15 to 20 minutes or until thickened. Remove the pan from the heat, and add the butter and vanilla. Stir until the butter has melted completely. Allow the custard to cool. Preheat the oven to 325°. Lightly spray a 2 1/2-quart baking dish with nonstick cooking spray. Line the bottom and sides of the dish with vanilla wafers. Slice two bananas on top of the cookies. Then add another layer of cookies, and then two more bananas. 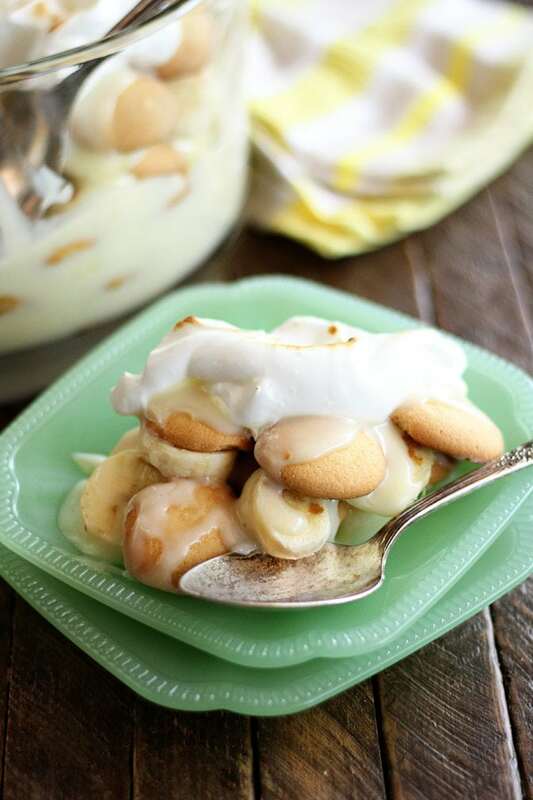 Pour the custard over the bananas and cookies. Whip the egg whites with a hand mixer or in a stand mixer with a whisk attachment until they are frothy. Add the remaining 1/2 cup sugar to the whites. Continue beating until the whites form stiff peaks. Spread evenly over the banana pudding. Bake 12 to 15 minutes or until the tops of the meringue are toasted. My family loves homemade banana pudding. I have always made it like you have presented until my neighbor shared some of his pudding with us. It was great and said he use 1 can of evaporated milk. From then own I have added evaporated milk to my recipe. Try it & I think you will enjoy the different more mellow taste! I use evaporated milk in so many things! What a great idea! 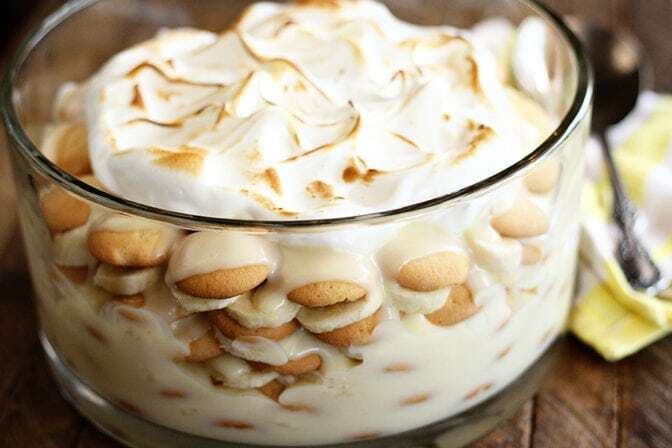 Banana Pudding looks so good! You are right indeed that comparison is the thief of joy. Your son will someday appreciate this piece of wisdom. Yum! 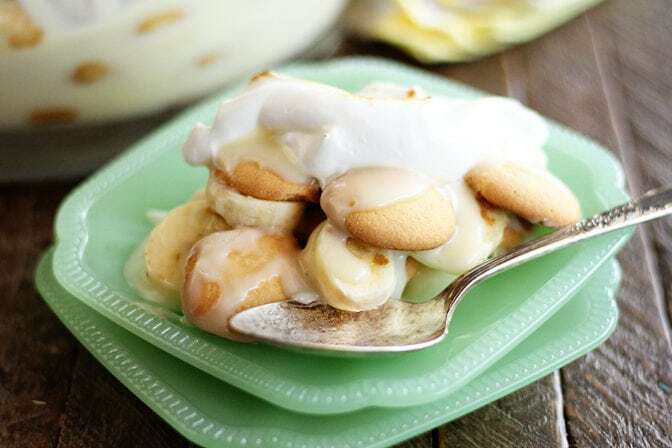 I love banana pudding with vanilla wafers. Its one of my favorite desserts! ‘Naner Puddin’…my absolute favorite! Thanks, Stacey! My dear sweet Mom used to say “The grass is always greener on the other side…until you get there.” I have never forgotten that one! I can’t tell you how many times I’ve whispered it to myself, and repeated it to my son. Yes! My mom has always said, “If you don’t know what to do, don’t do anything at all.” Only as I’ve gotten older has that made sense. 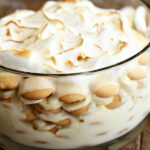 Love Old Fashioned Banana pudding, like the recipe that used to be on the box of Nilla Wafers. I have that recipe and it is the only one I use, my family will try just about all banana puddings but they always say ” Mom makes the best”. Your recipe seems fairly similar to the old trusty recipe, so we will definitely have to give it a try! I hope everyone approves! Enjoy! My recipe for banana pudding is very like yours (don’t add butter to mine) instead of cooking on the stove I cook mine in the microwave.Takes no time at all,kitchen is much cooler. I’ve heard several people mention doing the custard in the microwave, but I’ve never tried that. It certainly would save some stirring too! Cindy, would u mind sharing that recipe from the Vanilla Wafer box? I did have it but some how I have misplaced it. Guess b’cause so many things going on with the family. 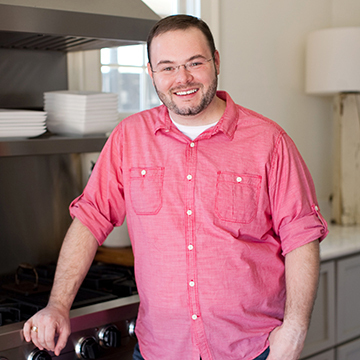 My husband had brain surgery and has really changed a lot. I would deeply appreciate if you would send it to me. Many blessings, Connie Obernuefemann. connieobernuefemann@icloud.com 618-604-2091. This is the absolute best dessert my grandmother made. She was making it before there was dream whip or cool whip to use. It’s a classic for sure! My son’s favorite is banana pudding. will make this for him when he comes for dinner this week. I so enjoyed your comments today. Have always taught my children (now adults) they are one of a kind, and God has given them each their own abilities and special gifts. It’s such an important lesson, Deloris! Great post! It’s a hard lesson to not only learn, but to practice because it is so easy to “look over that fence” and see greener grass. Sometimes even happens when we aren’t looking for it. Couldn’t you use a kitchen torch to brown the meringue instead of putting the bowl of pudding in the oven or would the texture be off putting with the meringue? So true! Gotta put those blinders on sometimes. I think that would work just fine. Many people are concerned about eating raw eggs, but I’ve never had a problem. Sometimes the bananas I use get icky, meaning not good, just strange tasting. I use ripe bananas. What am I doing wrong? Thanks for your help, and thanks for the great quote! I don’t like the texture and color that the bananas turn when you pour the hot custard over them, that’s why I always cool my custard completely first. Thank you~~ I love your recipes! I may be in the minority here, but I like the pudding to soak into the vanilla wafers. Would that be possible by doubling the amount of pudding? Some may not like that mushy texture, but to me it’s the best part. Let me know what you think, and thanks. I will try this recipe because my husband loves “naner puddin’ ” . If I were to use Cool Whip, he may try putting half the container on his serving, LOL. That lovely meringue would be a better choice! I also enjoyed the message in your post. “Comparison is the thief of Joy” —wow! I had never heard that and those ARE words to live by. THX on both scores. You are so welcome, Linda! Enjoy!! This recipe was delicious! I did substitute 3 cups of milk with 3 cups (24 oz) of evaporated milk because my mother in law always used evaporated milk in her banana pudding. We can’t stop eating it! Thank you for this!! My family loved it! I’m so glad that y’all enjoyed it! 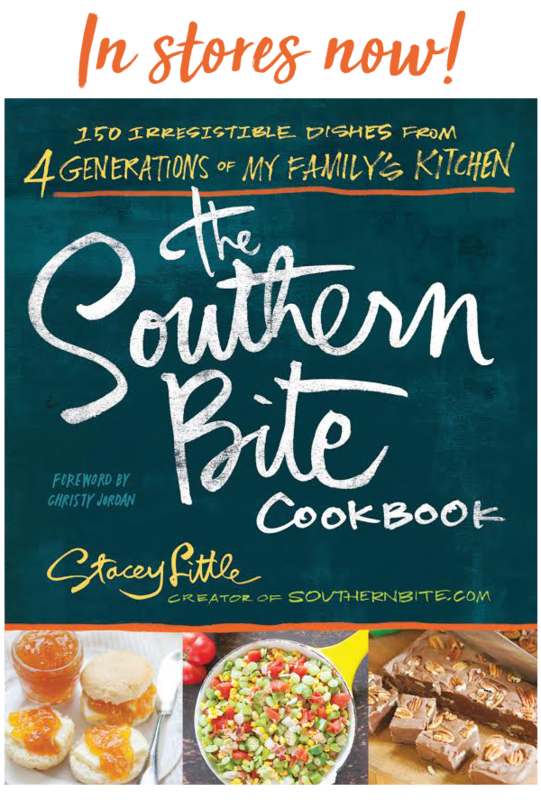 Love the evaporated milk idea! I love using that in stuff like this! I would like to have that Vanilla Wafer box recipe too!